People with children often experience a role reversal later in life: They transition from caring for their kids to having their kids care for them. If your parents are at that stage, you might already be struggling to keep them healthy and safe without impinging on their privacy and independence. That’s where Evermind comes in. Evermind’s biggest upside is that you don’t need to travel to your parents’ home to set it up. They can do it themselves (more on this later). Once that’s done, the person being monitored can go about their daily routine without any further interaction with the system. The downside is that the system doesn’t generate enough useful data to justify its $199 price tag and $29-per-month ongoing subscription fee (fortunately, there’s no long-term contract). I tested Evermind with my own father, who is living in an apartment by himself without round-the-clock supervision. I’ll cover Evermind’s main benefits before I explain some of its missing ingredients. The Evermind kit comes with three sensors that detect when lamps, small appliances, and other devices are turned on and off. 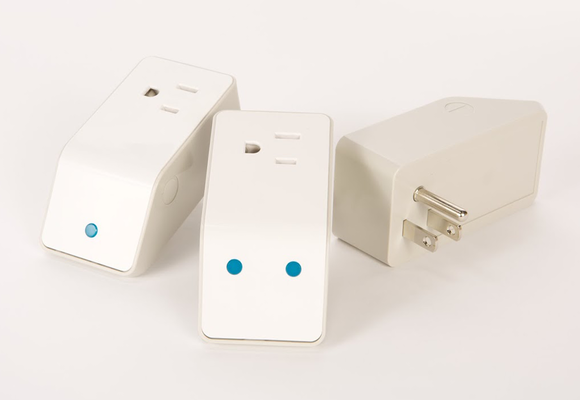 An Evermind system consists of three sensors that plug into power outlets between a lamp, a coffee maker, and a television, for instance. Cellular radios inside the sensors send a signal when the plugged-in device is turned on or off. That eliminates the need for a Wi-Fi network, broadband connection, smartphone, or any kind of hub, which an elderly person might not want or need. And since the sensors draw power from the outlet, there’s never any need to change or charge batteries. That’s crucially important because it eliminates any need for the person being monitored to interact with the Evermind system in any way. I plugged in two lamps (one in the bedroom and one in the living room) and a television at my father’s apartment. But I could just as easily have had my dad do this himself, because the Evermind sensors synced up to the Internet all on their own. I never had to push any buttons or run an app to configure anything. That’s pretty slick, and it’s important because he’s not one to just sit and watch me configure gadgets without getting fidgety. If your parent lives far away, you can have the system shipped to them so they can handle the installation. At home, I fired up the Evermind.us site and typed in a code to register the sensors. Just like that, I created a login and saw the three sensors. I added my cell-phone number and email address so that Evermind would alert me using both avenues. The alerts let me know when my dad turned on the lamps and TV each day. You can set the Evermind.us site to alert you each time that sensor detects an on and an off signal, or only the first on. You can also set timeframes for monitoring, such as only between 8AM and 10PM, and only on certain days of the week or only on weekends. 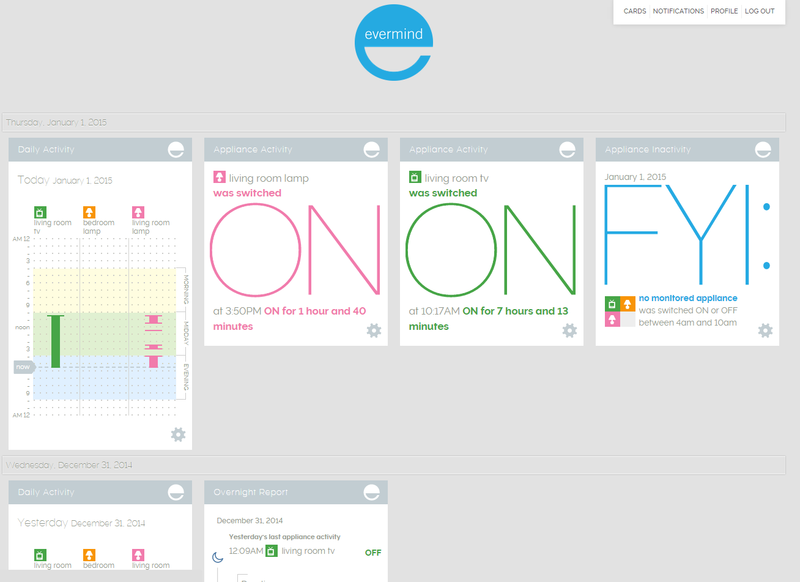 The Evermind web portal tracks when the sensors report devices being turned on and off. You can also configure it to alert you when expected events don't happen. As I monitored the activity, Evermind started showing a daily history that used some basic machine learning. It noted, for example, how my dad turned on the bedroom lamp each morning at 5:30 AM and turned it off at 8:30PM, and it showed a daily chart that indicated how long he was up each day. It recorded how often he used the living room lamp (10 to 15 times per day), which I interpreted as how often he was reading. And I was surprised to learn that he used the television only once or twice in an entire week. So I knew he was waking up at a decent time, that he was moving around the house, and that he was sleeping, even if that was based only on his lamp and TV usage. It’s all straightforward and pretty basic, but that’s also its biggest shortcoming. Evermind doesn’t offer a mobile app, so all you have to go by are the emails and text alerts and then view summaries on the Web. An app that recapped everything so I could see all the information at a glance would be much appreciated. A sensor on the front door would let me know if he was going outside for walks. More importantly, the data is only somewhat helpful. I learned how often my dad reads and sleeps, but not if he was ill, if he was using the bathroom too often, if he was taking his medication, or if he was sleeping well. It could be argued that sensors capable of reporting some of these details would be necessarily intrusive to his privacy, but a sensor on the front door would let me know if he was going outside for walks, one on the refrigerator or pantry would tell me if he was eating regularly, and another on the medicine cabinet would let me know he was taking his medication and at the appropriate time. $199 is not at all expensive for the peace of mind that comes with knowing your elderly parent is active and well, but for that and a $29-per-month subscription, I expected to get more ways to monitor my dad’s activities. Yes, providing the option to tie Evermind into an existing home-control system—or even just a WeMo light switch, or a Dropcam security camera—would necessarily make the system more complicated, but it would also make Evermind more informativem, effective, and valuable. 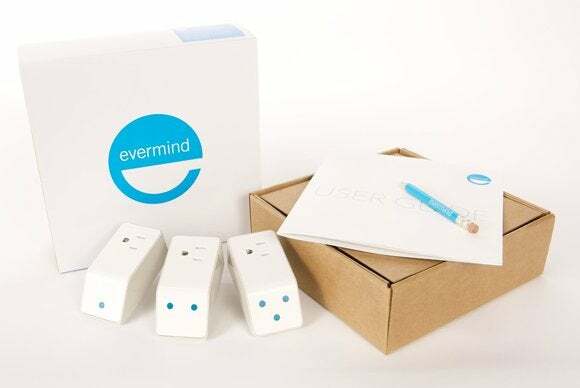 Evermind is a good idea for children who want to ensure their parents are following their usual routines, but there are a lot of things it can't do.